Botanique was manifested and creatively designed in Cape Town to take you on a journey into ancient gardens and bring the wilderness indoors, creating a feeling of intrigue, nostalgia, well being and serenity. We created these gender fluid fragrances to evoke emotion, enhance your mood and improve your state of mind. Botanicals were chosen for a sensual relationship with the outdoors, to combat digital fatigue, and escape the bustle of the city. 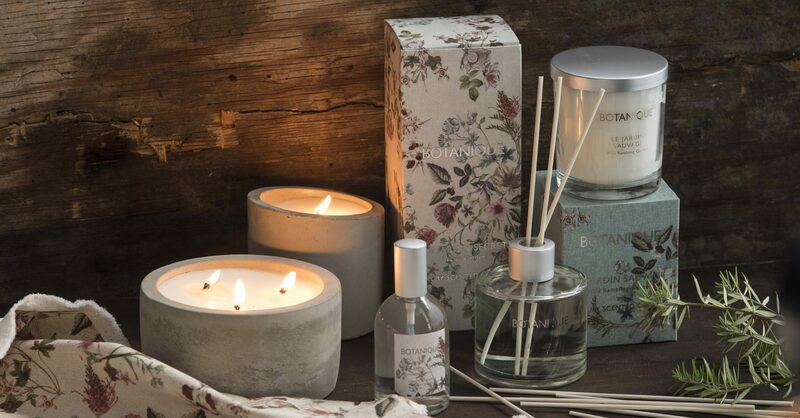 Beautiful fragrance provides a level of invisible design that adds a magical sensory element to the everyday. The beautiful bloom-inspired packaging of Botanique was designed by Carina Liebenberg, an in-house textile designer working for TFG. Her inspiration came from fresh blooms and natural textures that she juxtaposed. Each box is slightly different, allowing an artisan spirit of design and individualism to prevail. 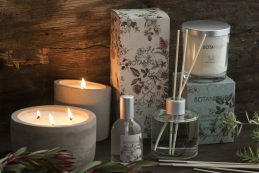 Fragrances were specially flown in and blended from fine world-renowned perfumiers and produced in Cape Town creating local jobs in both home fragrance production and packaging. Our inspiration draws off ancient gardens reminiscent of fresh rain, dew filled flowers and muddy earth. Three unique fragrances have been created and carefully manifested for @home exclusively. Mysterious, mystical long forgotten ancient blooms evoke a sensory journey into a secret garden with strong notes of nostalgic rose geranium and wild overgrown greenery. Exotically curious, heady notes of frangipani, vanilla and tonka bean that transport your senses and emotions to far away lands. Ancient wild herbal green notes reminiscent of a wild rambling garden echoing forests and wild foliage still wet underfoot. We were so delighted with Carina’s textile designs that we felt a limited edition of top quality hand towels with the botanicals as a unique edging were needed to add a magical layer to Botanique. 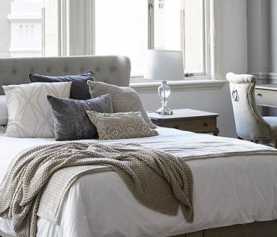 Muted vintage colours reminiscent of bygone eras that have an organic quality were carefully selected. 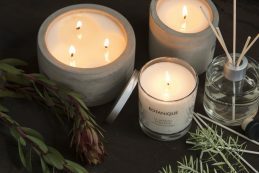 Candles have been poured into simplistically cast natural concrete containers for a touch of natural modernity and are reusable. 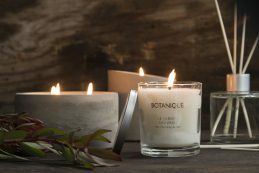 We hope your home will be filled with these intoxicating notes of light and heady scents of ancient blooms , foliage, forests and earthy organic wellness. NEW WEALTH IS EMPTINESS. 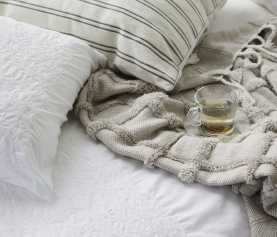 CURATE YOUR SPACE WITH LESS.